Veggies and potatoes as easy as 1-2-3! Just toss these veggies in the oven and you're halfway there. 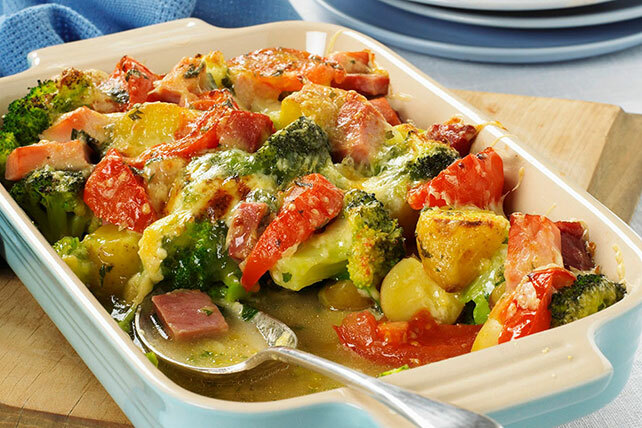 Serve this oven-baked side dish with your favourite chicken or roast and dinner is done. Combine all ingredients except cheese in large bowl; toss to coat. Spoon into 1.5-L baking dish. Cover and bake 45 min. Sprinkle with cheese and bake 5 min. uncovered.